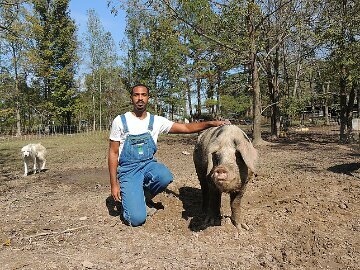 Winnfield native Le’Montio Hobdy opened Monte Farms, a heritage breed, pasture-raised pork and pastured poultry farm. After consulting with the Louisiana Small Business Development Center at the University of Louisiana–Monroe, Hobdy found he could produce success. With the help of the LSBDC at ULM, before opening the business in late 2014 Hobdy was able to determine critical problems, develop financial models and cost models, and develop a production cycle. “The biggest thing was the production cycle that they helped me organize so I could have a consistent supply to my customers,” Hobdy said. Hobdy successfully developed a market for heritage breed hogs and raised poultry products. Monte Farms uses rare breeds of pigs that originate from England to produce a superlative pork product. All of its pigs and chickens are raised on open pastures and they have 24-hour access to fresh grass. The company’s promise for success garnered Hobdy with the LSBDC at ULM Rising Star Award presented in May 2015. Hobdy has quickly experienced vast success as he supplies to some of Louisiana’s top-ranked eateries, including Monroe’s, Cotton; as well as restaurants owned by the world-renowned restaurateur Dickie Brennan of New Orleans. The LSBDC didn’t just limit Hobdy to ULM’s center, the Greater New Orleans and Bayou Region also chipped in to make sure Monte Farms would produce great success, along with the great meat. Hobdy received consultation from Dianne Sclafani, business consultant who is a restaurant and food specialist at the Greater New Orleans and Bayou Region Center. Sclafani helped Hobdy strategize to find more clients.